Its been the kind of spring that makes one want to get to the beach and feel the sunshine! While it has been fairly mild in Georgia, my poor family and friends in the mid-west have been bemoaning the late snow and cold weather. St. Louis recently broke a 100 year record for 12 plus inches of snow....I am sooo not missing living there and experiencing that. However, what really inspired me to make this card was the Design Team call over at Mo's Digital Pencil. The minute I saw it was open my heart started to pound quicker, and I let out a hopeful SQUEAL!!!! You are suppose to post something with your favorite Mo's image - LOL - I love them all, how could you possibly pick just one. This said, if I think too hard about it I'll never get an image colored - they are all too, too sweet and fun. So.....since I HAD to pick - I chose this lovely curvy lady with the delish umbrella drink. We will be heading to the beach in a few months so I have visions like this dancing around in my head. Yes, she is in a a "teeny, weeny, itsy, bitsy, yellow polka dot bikini" (hope your humming along now) with the tropics surrounding her. There are harder images to color, but she is oh so fun to play with!!! Of course I used my Copics to color her, my Spellbinders to frame her, a nicely discounted Paper Studio embellishment, and some ribbon, all mounted on some fun two sided Jillibean Coordinating paper. I like the way the chevron on the lower layer mimics the ripples in the sand as the ocean washes up on the beach. Yep, this will be me when we finally make it to the sand and sunshine.....an umbrella drink is a must! I finished of the inside off the card as well - I used two shells that I stamped, colored lightly, spritzed, then bent into a shell like shape. They are adhered with some Collall glue to give them dimension. My original thought was to use them on the outside of the card, but this little lady screamed for a palm tree and coconuts. I had to laugh when I read the Design Team call requirements....does Mo really think it is a burden to have to color and play with one of her images weekly, or any time for that matter - I say bring it on - that is my kind of play. Playing around with some background paper from an old hymnal and made this little card. Please don't start thinking of me as the 'crazy bird' lady since this is my second bird post in a row - as they couldn't be more different. This little chickadee is by Our Daily Bread Designs, and cut out using their matching die as well. He is sitting on a hymn titled "Let Him In" and is colored with my Copics, then mounted on two circles cut with my Spellbinders circle dies. The background is some kraft paper run through a Cuttlebug Embossing Folder finished off with some ribbon and a little red embellishment. I will be placing this in the challenge over at Our Daily Bread Designs since I used one of their stamps you can see details here if you wish to join in. Shopping with my friend Katie a few weeks ago and came across this Art Impressions stamp...I just couldn't resist purchasing him. Today I played with him and kept it pretty simple. Colored him up with my Copics - inspired by this bright orange, then layered him over a floral background with multi colors, and used the sentiment he came with. Just love this grumpy lookin' fella....had to give him a little yellow in his eye to make it pop and go along with his gloomy 'tude'. This will be going in my Birthday card stash, but may not be there long, I have a few people with birthdays soon that he might need to bring his good wishes to, tee hee! 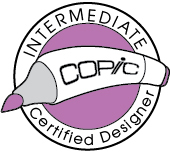 Last Saturday the Intermediate Copic certification class was finally close enough for me to travel to for the second leg of my certification. It was a 62 mile trip, but at least within the State of Georgia. How awesome it was that Lori Craig taught the class, she was my instructor for my first certification in St. Louis almost two years ago. Colleen Schaan was also in the house with us for the day (a Georgia resident) - two fabulously talented and fun ladies. To add to the excitement I was able to take the class alongside my sister stamper and friend from Splitcoast Stamper - Katie aka Mattsgirl and the Inky Peach Designs in Blogland. Katie is one of the 'Jammer Town' girls, where we issue throwdowns to each other and often poke fun at others, as well as ourselves, with cards that have little stories that go along with them. Copics are one of those tools that I said early on - "Uh uh, ain't gonna invest money is those!! No way, who needs em!" Then they began to creep into my work, first a gray or two to shade with....then maybe a little pink and green for some flowers.......and then - "How can I NOT color this image!!" 120+ markers later I knew I was hooked. So now the real playing begins.....after the class you tend to hold yourself up to a whole new standard, and I am working to not be too hard on myself. Some images just don't need to be over colored, and maybe should even just be kept simple. That said, each time I color I know I will be wondering more and more about my light sources and trying to be brave enough to put that oh so often needed 'cast shadow', while always trying to remember to just have fun with this hobby and craft I so enjoy. This picture is of Colleen and Lori.....great sports who put up with my irreverent sense of humor throughout the class. They donned the hats that I brought for Katie and myself - a little joke we have with a sister stamper who always talks about 'flinging' her Copics around the room when she colors, cuz they frustrate her so at times. They read: Caution Beware of Flying Copics - with some wings for fun. I mean really, you gotta love these gals for putting up with me during class - then again they can give as good as they take! Thanks for letting me share - if you love Copics and enjoy playing with them I recommend you consider the classes offered by Imagination International - I feel I gained insight into working with them in both of the classes I took....now to practice, practice, practice!!! This card was made for a co-worker whose father passed away. She is a talented and creative woman who re-purposes vintage jewelry into beautiful bracelets. I am lucky enough to own one. While all my co-workers are women, she just stands out as a 'girly' kind of girl, so I wanted to make an especially feminine looking card for her. The stamp is by Our Daily Bread Designs and I used the matching die with it. My inspiration for this card came from one Becca Fekken - at Amazing Paper Grace. I didn't use quite as many details as she did, but the same stamp and bow design. It is always an inspiration to receive her updates by e-mail. I struggled with something to use around the die, I knew I wanted black but not something too solid and strong -so I dug into my die box and came up with a Cheery Lynn die. I made the stick pin, even coloring the pearls with my Copics to match. Adding a stick pin for an embellishment has been a personal goal of mine for a while, it was with pleasure that I added it to this card. My sweet and lovely bow was made using the Becca Bow Maker, a recent addition to my stamp room....it really does help make a lovely and consistent bow for a card. The card size is 5 x 7 - with the bow and stick pin I needed to make a box to present this card in. Unfortunately, I didn't get a picture before I delivered it. It was really neat looking, I used the same embossing folder for the top layer of the box and backed it in black as well. To finish it off I punched a 12 x 2 inch piece of paper with a Martha Stewart lacey edge punch and created a belly band for the box. I adhered some ribbon around the band with a simple bow. My friend Katie has been encouraging me to play along in some challenges so I am putting this card in the challenge over at Flourishes....FTTC214 (Layer two or more ribbons together) - I think using the lace and ribbon together qualifies. 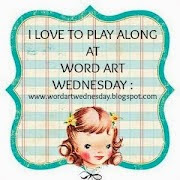 Also joining in at Word Art Wednesday and Cute Card Thursday. Made this card for the Teapot Tuesday challenge over at Splitcoast Stampers. This weeks card will be mailed to a gentleman who is ill and in need of some cheering up. He has a love for the Lord and enjoys gardening. This basket of goodies and sentiment from Serendipidity Stamps seemed to be tailor made for him. I used my Spellbinders Deckled Edge Rectangle for the image, and my Grommet Tag die for the sentiment. The gloves were fussy cut and have a dimensional behind them. The image was colored with my Copics and I tried my best to keep it gritty and earthy looking. Its always a pleasure when I can find time to make a card for the Teapot Challenges....most weeks the challenge has a theme as well as a destination for the card made - its nice to send an RAK in the form of something I enjoy doing. Challenges: MMTPT244 at Splitcoast Stampers.